Today I introduce you to a simple and healthy vegetable croquette recipe. This time I cooked the croquette in the oven so there is no need to worry about hot oil and messing up a kitchen. The ingredients are pumpkin (C. maxima), onion and carrot. The differences between this recipe and the potato croquette recipe I posted earlier are taste and nutrition. I used C. maxima pumpkin (Kabocha), which is common in Japan. C. maxima pumpkins are especially high in vitamins, potassium, fiber and beta-carotene. They have more of a strong sweet taste than butternut squash, are not soggy and taste very good. 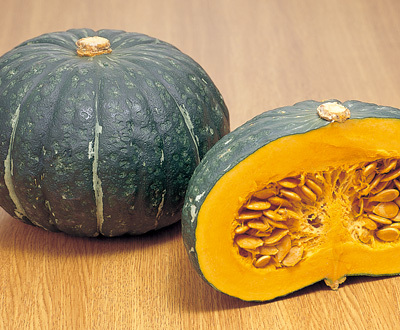 So this kind of pumpkin is good for simmering dishes, a traditional style in Japanese cooking. In this recipe I show you my mother’s original batter for fried dishes. Normally fry-batters are made from flour, egg and panko (bread crumbs). My mother’s batters are an egg mixture (egg, flour and white vinegar) and panko (bread crumbs). The white vinegar makes the croquette batter very fluffy texture. You can use this egg mixture for any fried dishes such as fried chicken. Please try it! Categories: Korokke/Croquette | Tags: beta-carotene, C. maxima, carbohydrate, Carrot, Delicious, Easy, fiber, Healthy, Homemade, Nutrition, Onion, oven, panko, potassium, Pumpkin, simple, Sweet, Vegetable, Vinegar, Vitamins | Permalink.